My daughter, 11, and I share a love of reading. We both love to curl up with a good book. That’s why I was pleased when Little Bee Books approached us to read Ask Emma, a new book for tweens. Ask Emma is about a 7th grader named Emma who decides to publish an advice blog. It’s written by a mother-daughter team, Sheryl and Carrie Berk, who have penned books including The Cupcake Club and Fashion Academy. It’s loosely based on Jane Austen’s Emma and the 90s hit movie, Clueless. As if! 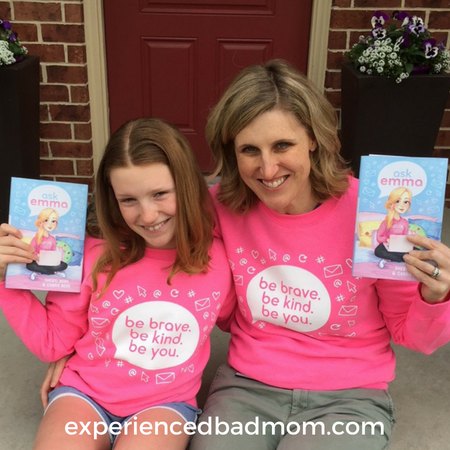 We share below our thoughts on Ask Emma as well as some comments from the authors who participated in an interview with several blogger-daughter pairs. At first, Emma seemed a bit preoccupied with getting attention for her blog vs. helping others. But then we realized that Emma from Ask Emma is just like Jane Austen’s Emma (and Cher from Clueless! ): she’s a bit misguided in her attempts to help others. But, this lead to more self-awareness and self-understanding. “Ooo, it’s getting juicy,” my daughter said during one of Emma’s misguided attempts to help. Emma tells a girl who is sensitive about her ears to tie a decorative scarf around them before trying out for the cheer leading squad. This leads to disaster: the scarf falls down over her eyes during try-outs and she takes out half the squad in a tumbling pass gone wrong. “A message we really wanted to put out there,” comments co-author Sheryl about Ask Emma, “is that kids should own who they are and never be ashamed of who they are. It’s what makes you special and different and wonderful. Someone posts nasty comments on the Ask Emma blog as well. This cyber-bullying theme is close to fifteen-year-old co-author Carrie’s heart. “My experience with cyber bullying really reached its peak when I was in middle school, so I feel like my story with Emma experiencing cyber bullying would resonate most with middle school students,” she says. Emma does the right thing in talking to her friends and adults about the cyber bullying. She ends up coordinating a whole anti-cyber bullying event at her school to get the message out: Be kind. Be brave. Be you. “It’s a really important message, especially at that age in middle school, to know that you should believe in yourself and own who you are and not be afraid to speak your voice, and not just be a follower- be a leader,” notes Sheryl. 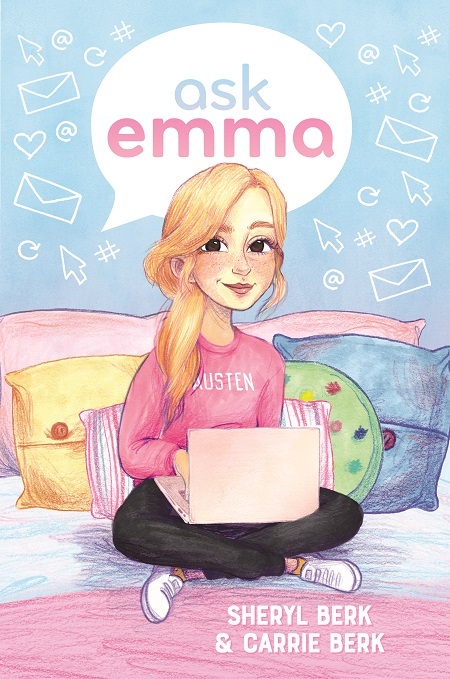 Besides the strong anti-cyber bullying message, there are many more lessons in Ask Emma like self-acceptance, self-confidence, and kindness that are perfect for its target audience, kids ages 8-12. Middle schoolers in particular should be able to relate. My daughter and I give Ask Emma two thumbs up. Have you ever read the same book as your daughter? Are you a Jane Austen fan? What books do you recommend for tweens? My son is reading the Land of stories series by Chris Colfer (of Glee). They re really good. I read the 1st one with him. Sounds like some excellent messages in Ask Emma. It a.different world now than what we grew up in. Completely different challenges. My daughter has liked those “Land of” books, too. It’s nice to know there are good books out there as I can’t necessarily say the same for TV shows or movies these days. This sounds like a great book and one that I would have loved to have read with my daughter back in the day. How very clever of the authors to reach out to their target audience for reviews, too. Really brilliant. I haven’t read a book aloud with my kids in years. And we didn’t read this one aloud, either, but it was fun knowing that we were reading the same book. She had a much better take on some of it than I did, because it was written by someone closer to her age. I liked getting that vibe from her and it made me like the book all the more. Happy reading! Maybe Poppy likes to listen to you read aloud?! Words for all of us to live by, for sure! Are those shirts available for purchase? I shall ask about the sweatshirts. It is a great motto, for sure! Check out these giveaways in case you can win a sweatshirt! Having been a junior high and high school English teacher for years, I LOVE this twist on classics. Love when authors do this. And yes – for sure I’m a Jane Austen over-the-top fan! I have two grown daughters – one of whom carries my same love for Ms Austen. I read all the Laura Ingalls Wilder books to and with my kids (even my two sons) when they were little. Some favorite memories there. My youngest daughter (who is 33) and I recently took a cross country trip to see all the Little House on the Prairie sights – even stayed in a covered wagon in De Smet, Iowa at one of their homesteads. So fun! I don’t know – how about the Anne of Green Gables books for a tween? They’re so charming. Hoping you have a lot of fun reading this summer – perfect time to read for fun. That is so amazing that you got to see the Little House sights! A friend took her husband to Mankato a few years ago and did the whole Betsy, Tacy, and Tib vacation. Those books are for a bit younger than tweens, but I loved that series. Thanks for commenting–and recommending!